In the first regular season game for the reigning NFC Champions, the Atlanta Falcons traveled to Soldier Field to face the Chicago Bears. With new OC Steve Sarkisian calling the plays, the offense never really got into a rhythm, unable to score a TD after a 11 play 62 yard drive, resulting in a 48 yard field goal in there opening possession putting them up 3-0. The defense held up the Bears to cause a 3 and out on their first drive after only gaining 7 yards. Towards the end of the 1st quarter, the Bears offense got a spark from a 15 yard completion to wide receiver Deonte Thompson and a 15 yard rush by backup running back Tarik Cohen that put the Bears in field goal range. With 4 seconds left in the 1st quarter, Connor Barth was able to make a 54 yard field goal to tie the game at 3-3. As the game continued, both offenses became stagnant, causing back to back punts, until Matt Ryan began to pick apart the defense with multiple completions to orchestrate another 11 play 83 yard drive that resulted in a TD, courtesy of a 5 yard rush by Devonta Freeman, making the game 10-3. All day the Bears seemed to respond to every scoring drive the Falcons had with one of their own and this became evident when Bears QB, Mike Glennon, led a 7 play 75 yard drive that started with a Tarik Cohen 46 yard run and ended with a Jordan Howard 4 yard TD run that tied the game at 10-10 with 14 seconds left in the 1st half. 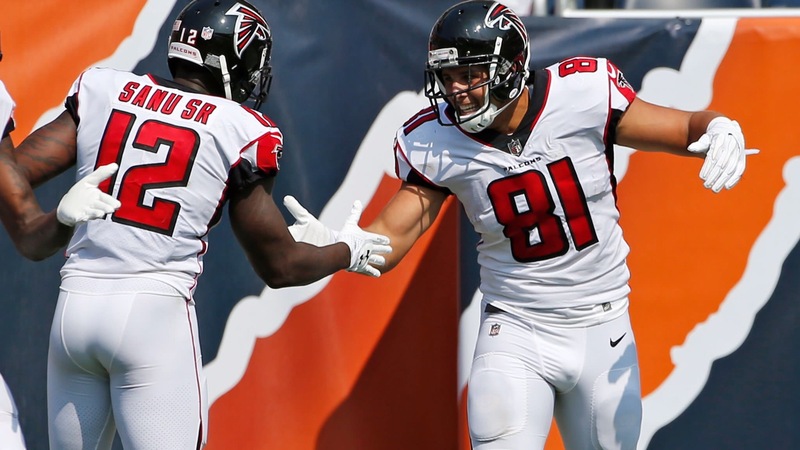 The difference in the 2nd half for the Falcons and gave them a little cushion of a lead, came in the form of a 88 yard touchdown catch by Falcons TE, Austin Hooper, who after not catching a pass the whole game, was able to break free from a defender and take it to the house. His afternoon didn’t end there, with 7:16 in the 4th quarter, and the Falcons up 20-17, Hooper caught a 40 yard pass on 3rd and 10 that gave the Falcons the last offensive drive needed to win the game. With another catch on 3rd and 3 later in the drive, put the Falcons in field goal range and gave them a 23-17 lead after a 37 yard field goal. Hooper ended his career high game with 2 catches for 128 yards and 1 TD. After the Falcons collapse in Super Bowl 51, the Chicago Bears were determined to give the Falcons a scare in the final 3:18 of the game, when they went on a 16 play 68 yard drive that put the Bears on the Falcons 5 yard line with the chance to win the game with a TD. Today someone on the Falcons Defense needed to make a play and LB Brooks Reed came to the rescue. On 4th and goal, Reed got free from a OL and sacked Glennon to seal the victory. Reed had himself a game and ended with 2 sacks and 3 tackles for loss. The win gives the Falcons a 1-0 record heading back to their new home, Mercedes-Benz Stadium, next week to face rival Green Bay Packers, on Sunday night, September 17th at 8:30pm.